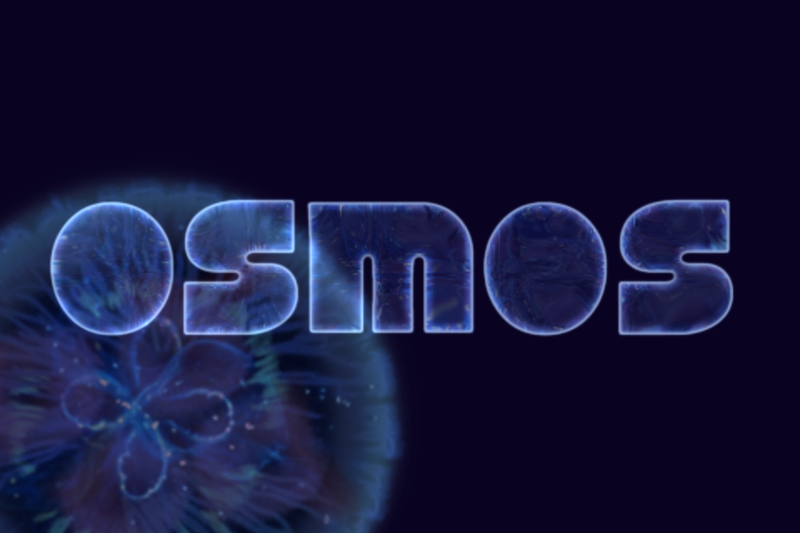 Osmos HD is a fun little physics-based game developed by Hemisphere Games for Android devices as well as iOS, Windows, Mac and Linux. It's both simplistic and minimalistic, and it provides a welcome change of pace from the standard assortment of puzzle games and twitchy action titles. In fact, Osmos HD is ridiculously hard to play during the later levels if you try to be too fast because of the way the game mechanics work. It's really not like any game I can remember playing before, and that only increases it's appeal since it's refreshingly different. You start off with a sort of tutorial that explains how the game works and introduces you to new game features every level or so. They call this Odyssey mode, and after you complete it you unlock the Arcade mode as well. There are 27 levels in Odyssey mode and 72 in Arcade mode, and in Arcade mode you can also play at different difficulty levels. You can even speed up or slow down time with a convenient and easy to use slider at the bottom of the screen, and this allows you to add to the challenge or help you out in a tough spot. The game takes place on a two-dimensional plane representing space, and it features really smooth and accurate physics. The universe is made up of different sized motes, which are little round organisms, and you control one of them. Through most of the game your goal is to take your character, a mote, and grow it to become the biggest mote in the level. To accomplish this you must absorb smaller motes to increase your mass, but in order to move around you must expel some of your own mass to move in the opposite direction. If you bump into a larger mote it will start to absorb your mass, and if you bump into a smaller one you will start to absorb its mass. Most of the motes are just kind of idle and slowly drift around, but as you progress you will run into motes with various abilities. Some of them have decent artificial intelligence and will move around trying to absorb smaller motes and become the biggest, just as you will be trying to do. Other motes will attract any smaller motes around them, and yet others will repel other motes around them. You'll even have motes that project a huge mass so that other motes orbit around them, and the physics really shine here. In addition to the "become the biggest" levels which make up a lot of the game, there are some variations to add a bit of diversity and increase the fun factor of the game. In some levels you'll be orbiting in the gravitational pull of a massive mote, and you'll have to ride the orbit around and absorb some satellite motes without getting sucked into the massive one. In other levels you'll be chasing a fast mote around trying to absorb it as it speeds away from you and gets bigger. The game eliminates any guesswork when you're looking at another mote that's nearly the same size as you, because motes that are bigger have bit of a red glow around the edges. The moment you become bigger, the red changes to blue so that you know you can safely absorb them. The graphics themselves are beautiful as well, and while they're all really simple they are really sleek and vivid. Animations are smooth and creamy, the physics are accurate and the whole game reeks of gloss and polish. The music in the game is just as good as the graphics, with some wonderful ambient tracks of mellow electronica that really mesh well with the visuals. You won't be muting this one folks. The controls are pretty smooth, you just tap on the screen beside your mote to eject matter in that direction and propel yourself the opposite way. The game makes great use of pinch-to-zoom to zoom in and out of the game world smoothly and effortlessly, so you can get a wide overview of the level or zoom in to admire the silky visuals. It does auto-zoom a bit depending on the size of your mote, and occasionally this bugs me but it's overall a terrific design that works really well. My only other complaint with the controls is the fact that on a small screen it's difficult to be really accurate sometimes, but it's by no means a deal breaker and I've been playing this game quite a bit on my Motorola DROID 4 lately. I can only imagine how great it would be on a tablet instead. Osmos is compatible with most Android devices that run Android 2.2 or higher and have multi-touch support. While it works on a lot of devices, it uses high-resolution graphics for a better experience on devices with a resolution greater than 320x480. If you're unsure about the game or if it will work on your device, take a look at the list of supported devices on the company's website and/or check out the free Osmos Demo first before you buy the paid version. Cut the Rope is a puzzle/physics game from ZeptoLab for Android devices (and iOS, BlackBerry, Symbian, DSiWare, etc). It's a casual game like Angry Birds that can easily be picked up and played for a few minutes here or there, but while it doesn't require a huge time investment it does take quite a while to completely finish. More levels have been being added every few months as well (and for free), so for the 99 cent price tag this game does offer quite a bit of gameplay. I play it on my Motorola DROID 4 where it runs smoothly and flawlessly. The understandably limited story revolves around a box left on your doorstep, and inside is a cute little monster named Om Nom. Also in the box is a piece of candy hanging from a rope, and little Om Nom is hungry and has quite a sweet tooth. It's your task to cut the rope so that the candy drops into Om Nom's mouth -- sounds simple right? Well, sometimes it is, and other times it's frustratingly difficult depending on what obstacles are in your way and how good your timing is. You see, there are more than just ropes involved, and the further you progress into the game the more obstacles get placed in your way and the more different objects you have at your disposal to help you avoid them. It's easy to cut the ropes; just swipe your finger across it at any point. Eventually you'll have spikes to avoid that will destroy the candy. You'll have spiders crawling along the ropes heading towards the candy, and you have to make sure that particular rope is cut before the spider reaches it. You'll have bubbles that float up into the air when the candy is inside them, and you have to touch the bubble to pop it at just the right time. Bellows that you tap to blow the candy to one side or the other; or electricity that will destroy the candy if it touches it. Oh, and all the while you'll be trying to bump the candy into 3 stars that are placed around the level before you give the candy to Om Nom. In some levels getting all 3 stars is easy, but in others it is deceptively difficult. Sometimes you'll have to be precise, other times you'll have to be fast, and later levels will often require both skills. Many times it will be frustrating as you have only a few different things to do, and none of them seem to work to get all of the stars. Try, try... try, try, try again. The physics are surprisingly accurate though, so with some trial-and-error and some careful consideration every level can be completed within a few minutes. I usually break out this game or one of the other casual games I have on my phone when I'm sitting in the waiting room at the doctor's office or something and am going to have a few minutes to kill. I'll play through a couple of levels while waiting, and when it's time to go I can just shut it off and not worry about losing my place or getting to a save point like I would in many other games. The controls are all real easy -- touch this, tap that -- and they execute smoothly. Occasionally you'll have something like a rope that needs cut hanging across a bubble that you don't want popped yet and you'll accidentally pop the bubble because they're so close or overlapping. Granted that's annoying, but since the levels are so short and only take 10-30 seconds each to complete you don't feel quite as annoyed having to restart the level again when it happens. A good chunk of the levels take place on a single screen, but many scroll in one direction or another to expand the play area. Everything takes place on a flat plane with Om Nom usually at the bottom of the screen, and there are hundreds of levels organized into various "boxes". Each box contains 25 levels, and at the time of this writing there are 11 different boxes ranging from the cardboard box at the beginning and the DJ box at the end. Only the first box is unlocked at the start, but as you collect the stars in each level you unlock the next boxes with the final DJ box requiring 550 stars to unlock. The graphics are polished and colorful while the animations are smooth. The sound effects are cute and fit the theme of the game nicely, and while the background music is nice and mellow it does get fairly repetitive. Often I have the sound turned all the way down when I play because I'm sitting in a waiting room or someplace that I don't want to bother other people, but when I happen to play a couple of levels sitting at home I usually just leave it up. You can turn off the sound and music separately though, so if it gets repetitive just turn off the background music and be done with it. Cut the Rope is a pretty decent game overall, and while it's not the type of game I usually get into I really wanted a few small casual games to play here and there since my son was born. Appointments and stuff are really boring, and Cut the Rope turned out to be just the right amount of time sink to help eliminate that problem. Definitely pick it up if you're into casual puzzle games.